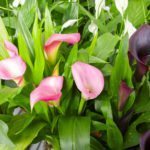 I have planted many colored calla lilies in my garden and most have turned white. Is there a plant food to recolorize the lilies, and if so, what is it? Have they bloomed different colors in previous years, or is this a first year planting?